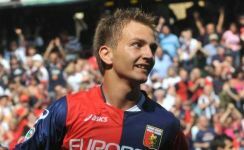 Besides the 6 new players in capitals in the line-up Genoa also bought several other new players while also two new wing-players will arrive before 2nd September when the transferperiod stops. Last week Genoa draw in La Spezia (2-2) after 90 minutes and lost the deciding penalty’s. The goals of Genoa were scored by Gilardino (see foto) and Lodi. Genoa now is out of the Coppa Italia and only has to concentrate on Serie A.
Serie A starts this season with the match Inter-Genoa on Sunday 25th August at 18.00 hours. In the 2nd playround Genoa plays at Sunday-evening 1st September at 20.45 hours at home against Fiorentina. After the break for the Italian National team we play the away-derby in the weekend of 14 and 15 September. The return of the derby is in the weekend of 1st and 2nd Februari 2014. Our yearly tournament United in the name of Genoa is in the weekend of 19 and 20 October when Genoa plays in Marassi against Chievo Verona. The trip of 11 days of Genoa in England was a big succes. Goalkeeper Mattia Perin didn’t take any goal in the 3 matches against West Bromwich Albion (0-1, goal of Lodi), Aston Villa under 21 (0-2, goals of Velocci and De Maio) and Stoke City (0-0). 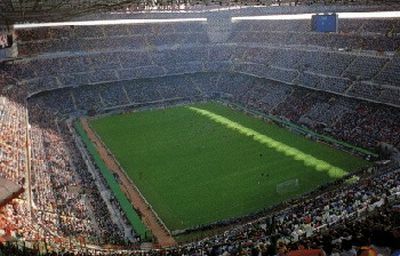 Next Saturday Genoa plays in the third round of the Coppa Italia in Stadio Picco against Spezia that plays in Serie B. In the 2nd round Spezia beat Pro Patria (Serie C-1) with 4-2 after extra time (2-2 after 90 minutes). The last time both teams played against each other was in Serie B in the season 2006-2007 when Genoa first lost in Marassi (1-2, goal of Adailton) and did win the return in La Spezia (1-2, goals of Di Vaio and Criscito).